Pre-pro tin litho advertising tray for Buffalo Brewing Co of Sacramento, California. 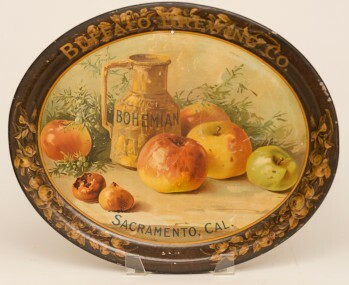 Buffalo produced some of the most attractive and collectible trays in the hobby and this early stock tray is one you don't see often. There is a nail hole at 12 o'clock on the face and some general wear and scuffs, and nicks over the tray.